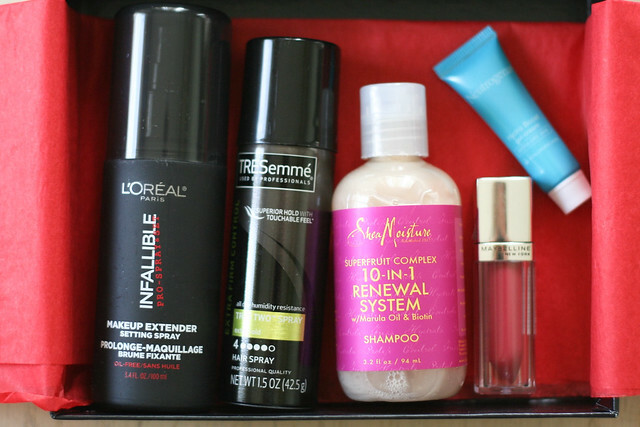 After I posted my review of the Walmart Beauty Box earlier this year, the Target version was also recommended to me. Word on the street (well, internet) was that these boxes always sell out rather quickly, but if you can snag one they are more than worth the $5 price tag! One morning, I was checking one of my favorite deal-finding blogs (thanks, Freebie Shark!) and they had a post about Target's Spring Beauty Box being available. I was lucky to stumble upon the post right after it went live, so I had time to scramble and buy one myself (saving a handy 5% using my beloved REDcard, which I totally recommend for any Target shoppers—especially because it always guarantees free shipping from Target.com). The box arrived last week, and here's a look at what I received! L'Oreal Paris Infallible Pro-Spray & Set — I don't even know what I'd use this for, considering my makeup routine is about 5 minutes long and I don't even use foundation. I may pass this along to one of my sisters, who is much more of a makeup maven than I.
TRESemme TRES Two Extra Hold Hairspray — This is actually my go-to hairspray. Hurrah! SheaMoisture Renewal System Shampoo — I don't want to be a debbie downer, but this may actually be the worst shampoo. I'm still a little confused about it, because I'm pretty sure it should not be marketed as a shampoo based on how greasy it left my hair. I used it like any other shampoo, then conditioned normally and used my usual pre-blowdry product. Halfway through blowdrying my hair I kept wondering why my hair felt greasy, gross and like I hadn't rinsed out my conditioner (which I knew I had). After drying, my hair felt dreadful and I even rechecked the bottle to see if I had somehow missed important information on how to use this product. As someone who doesn't wash her hair more than a couple times a week, I'm scared to even try it again! I've literally never had an experience like this with shampoo, so I don't even know what the problem was. Bizarre, if you ask me. Maybelline Color Elixer — I'm a little picky about lip color, but this pink works well with my skin tone, and I like the feel of the gloss! It isn't sticky or sparkly. I'll definitely get good use out of this one. Neutrogena Hydro Boost Gel Cream — Because I'm waiting on some grown-up lady moisturizer to be delivered (it's been years since I've used moisturizer that is actually meant for your face, and I figured age 30 was the time to start being a bit more responsible!) this sample is definitely going to get me through the wait. It works great and feels perfect on my skin. 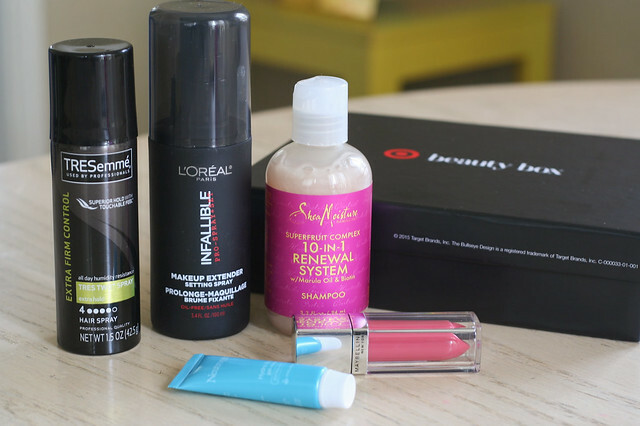 Overall, I wasn't blown away by the products included—especially because the beauty box was listed as being worth $38. I'm not sure who came up with that price, because there's no way on God's green earth this box is worth almost $40 when it is almost completely travel or sample sized products. (The only product listed as "full size" was the lip gloss.) I know I only paid $5 for the box, but goodness. I'm sure it wouldn't bother me as much if they hadn't put the $38 value on it. Maybe the previous boxes have featured larger products? Fill me in, if this is the case! There was a coupon included in the box that offers $3 off a $15 beauty department purchase from Target, so at least I know I will get use out of that! All things considered, I'm not sure I'd want to order one of these boxes again. For the buzz that seemed to surround it, it just didn't live up to the hype for me. I picked up this box too and felt similar regarding the $38 value. I'm sure it's more than $5 of product but not anywhere near $38. I have picked up previous Target boxes, I think 2 others? One had a Venus Razor and the other had a full size mascara that I loved. I think for $5 it's not bad and often times they are travel products so I put them in my gym bag and use them on gym days. I was underwhelmed with this box, too. Thanks for the warning about the shampoo - it sounds good for my dry hair but I don't want to take chances 17 days before my wedding! I've been using the gloss and it's nice and probably the only valuable item in this round. Yes, definitely wait on the shampoo! My hair had recovered when I washed it a couple days later, but I felt like a total grease ball for both of those days. Not a good feeling. (Probably not a good look, either, but I wasn't about to go through the whole blowdrying process two days in a row. Ha!) ;) And hurrah for wedding time! So excited for you! For $5, it feels like you can't go wrong.... even if they're all travel sizes. I did buy that Shea Moisture shampoo last week (it sounded so good for my fine hair! ), but now I am worried, because fine hair gets greasy easily as it is... I don't need any product to add to that problem. Oh well. I'll report back. Will probably try it on the weekend. What conditioner did you use? She moisture is usually targeted for women of color, or women with ethnic hair. So its meant to keep our scalp moisturized! Reason why your hair felt greasy! I agree, if you have a friend that's woc or with ethnic hair, it will work heavenly for her! I use it and my curls are so nourished! Thank you so much for helping clarify this for me, Darianne! So odd that they would include an item with such a specific consumer in mind for a general box like this. There was nothing at all mentioned on the product label, either. That's why I swore I was going crazy! Ah, well…at least now I know. ;) Thanks again! I was about to comment to say how much I love the Shea Moisture products, but then I read your review & YIKES. I haven't actually used their hair products, but I think, as Akirah said, they may be targeted toward women with very thick hair, be in black or just very curly (a lot of my Jewish friends have hair that needs a ton of moisture; I am not one of them). I will say that I LOVE their hand lotion, but I guess I won't be trying their shampoo! I'm so interested in this box, if only because $5 is incredibly tempting. I'm bummed to hear that it's so difficult to obtain. Gotta keep an eye out~! So glad some others piped in to give me feedback on the shampoo! I would have had no idea and thought that I just had a fluke experience. :) I've never tried any other Shea Moisture products, but they seem to be very popular! I skipped this particular box because I didn't think any of the products were for me, but I've loved (LOVED) their boxes in the past. Hopefully the next one is a winner! !